Who’s under the Red Hood? Bruce Timm knows, but he’s not telling. 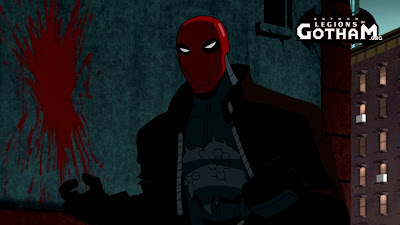 However, he answers a bevy of other questions in an interesting Q&A focused on the upcoming release of Batman: Under the Red Hood, the latest entry in the ongoing series of DC Universe Animated Original PG-13 Movies. Batman: Under the Red Hood is just the latest finished product to come from Timm’s canon of super hero vehicles at Warner Bros. Animation. A veritable legend among the creative forces in animation today, Timm has spearheaded the elevation of DC Comics’ characters to new heights of animated popularity and introduced generations of new fans to the characters via landmark television series and made-for-DVD films. The latter task includes the creation of the current series of DC Universe Animated Original Movies, which now number eight in total and each has been greeted with critical acclaim and nifty sales. Batman: Under the Red Hood will no doubt send more fans to the comic book stores clamoring for caped entertainment. QUESTION: What made Brandon Vietti the right director for Batman: Under the Red Hood? BRUCE TIMM: Brandon is one of our up-and-coming director/producer types who has been with (Warner Bros. Animation) for a while. I’ve known him for years – he actually worked for me back on the Superman/Batman series – and I’ve watched him work his way up from being a top storyboard guy to a director. His work on the first third of Superman Doomsday was very powerful. When we were looking around for a director for this film, Brandon was very anxious to do something completely on his own, and I knew he was ready. The thing about Brandon is that, besides just being talented, he’s super, super thorough. He’s very detail oriented. So it was a relief to me to have someone like Brandon in charge, because I could pretty much leave it up to him to run the show and I knew he wasn’t going to make any missteps. The end result is a very good film across the board in terms of action, emotion and design. 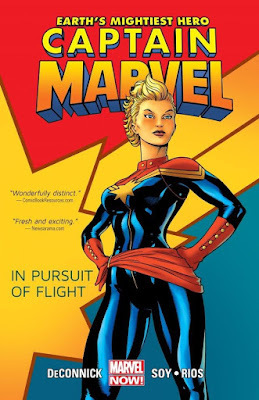 QUESTION: How did Judd Winick convince you that his comic series/graphic novel would translate well to an animated film? BRUCE TIMM: When we first heard that Judd wanted to pitch Red Hood as an adaptation for our DC Universe film line, Alan Burnett and I quickly got copies of the book and read through it. My first impression was that it was an entertaining comic, but it was quite a long mini-series and it had all these tangents of supporting characters who came and went through the course of the story. Quite frankly, it was confusing to me and I kept thinking to myself that I didn’t see how a lot of those things would work. The big thing about the story is that it’s a sequel to a big event in the history of DC comics – the death of Robin that happened back in the 1980s – and I didn’t see how we could set that up, because it all hinges on being a sequel to that story. Furthermore, the way the pitch was arranged, we were in a room in Burbank and Judd was in San Francisco and had to pitch over the speakerphone. But amazingly, every single problem I thought we’d have trouble making into a movie, Judd had fixed in the pitch. Judd had already clearly put a lot of thought into the entire film – how to stay focused on the main story, how to clean up the death of Robin thing, and how to eliminate all the extra baggage. He pitched for about 45 minutes and when he was done, Alan and I looked at each other and said, “Yeah, that’s a movie. Let’s do it.” And away we meant. QUESTION: Batman Gotham Knight was a collection of short stories loosely tied together and produced in anime. What made Batman: Under the Red Hood the right story to be the first true Batman movie in the DC Universe animated franchise? BRUCE TIMM: Seeing that this was going to be our first full-length Batman movie in the DC Universe line, we thought we really needed to have a strong story that wasn’t just another adventure story or a caper that Batman foils. We wanted it to be something that truly needed to be told in a PG-13 venue that had a fair amount of, for lack of a better term, adult content that you couldn’t normally do on television. And this story is loaded with it. It’s also a personal story to Batman – it does have an adventure plot and a crime plot, but the emotional arc of the story is rooted in Batman’s messed up history with family relations. 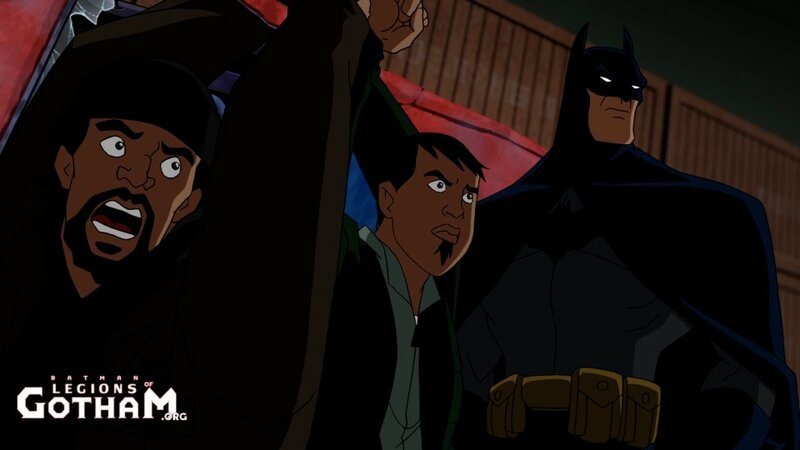 And especially in our animated universe, Batman always had a kind of dysfunctional family dynamic going on. He’s famously an orphan, he’s got Alfred as his surrogate mother/father, he’s always bringing in surrogate sons to mentor, and it always kind of goes badly. And this is, once again, one of the big expressions of that. So it makes for compelling drama as well as an exciting adventure. QUESTION: A few casting questions. Why Bruce Greenwood as Batman? BRUCE TIMM: It’s always a challenge to cast Batman because we invariably have to ask ourselves, “Who can we find out there who can hold their own against the legend of Kevin Conroy?” I’ve been following the career of Bruce Greenwood for a long time – I’ve seen him in a zillion movies and TV shows, and he’s always struck me as an actor who has this excellent, interesting voice and impeccable acting chops. And around the same time we were casting this film, I saw the trailer for the J.J. Abrams’ Star Trek – and there was Bruce Greenwood. So we tracked him down, he was agreeable, a great guy to work with, and he totally knocked it out of the park. QUESTION: John DiMaggio has played many comical villains. How did you know he’d be best as a villain who is also comical? BRUCE TIMM: The Joker is a very iconic part memorably voiced by Mark Hamill, and played in films by Jack Nicholson and Heath Ledger. Those are really big shoes to fill. John is a guy we’ve worked with for years playing tons of different kinds of parts, and every time we use him I think, “God, we’ve got to give this guy a bigger part.” He shouldn’t just be Thug #2 or the monster that Wonder Woman fights. We needed to give him a part that he could sink his teeth into. This Joker came up and it really required somebody who has comedic chops but also is a really good actor, and DiMaggio has got that in spades. He was definitely the right guy for the part. He came in and did something that didn’t sound anything like Mark Hamill or Jack Nicholson or Heath Ledger or Cesar Romero, and yet he sounds exactly like the Joker. He’s funny, and he’s scary as hell, and that’s just what you want. QUESTION: What did Jensen Ackles bring to the table as Red Hood? BRUCE TIMM: Red Hood is such a pivotal role in that he needed to be somebody who was forceful, threatening, weirdly sympathetic, and also had to be of a certain age. Not too young, not too old, just right. Andrea and I both knew of Jensen’s work, and he was one of those guys we had in our “Gotta work with that guy some day” file. And he fit the bill perfectly. He’s got an intensity in the booth that really matched the material. QUESTION: Were there any surprises along the way? BRUCE TIMM: One of the things I like the most about this movie is that, in the best possible ways, it kind of reminds me of a weird mesh of the Batman Beyond movie, Return of the Joker, and our first Batman: The Animated Series feature film, Batman: Mask of the Phantasm. It has a lot of the same kinds of themes, it has the same level of serious drama in it, and the same level of really good character development. I think it’s actually fully the equal of those two movies. It’s dynamite. Another interesting takeaway I got from this movie is that Brandon and I agreed that we really wanted to work to give this movie a unique visual feel. We deliberately tried to not make it look like Batman: The Animated Series. We tried a number of things in the art direction to stay away from that. But no matter what we did, it still kind of looks like Batman: The Animated Series. It’s weird. So when you watch the movie, there will be about four or five minutes in a row where you’ll forget about the different cast and slightly different character designs and it actually kind of feels like the series. On another level, there is a certain influence from the Christopher Nolan movies. It’s kind of in the tone of the film and the way Batman himself is treated and the feel of Gotham City. It’s not quite as realistic – our Gotham City is a little more stylized than the Gotham of the Nolan movies – but there is similarity in tone, which makes for a very interesting Batman salad. QUESTION: Judd Winick said his first introduction to Batman was the Adam West TV series, but that he knew even as a kid that it wasn’t the Batman he wanted to see. You’ve said that was your same entry point to the character – did you ever have the same sense of Batman’s positioning? 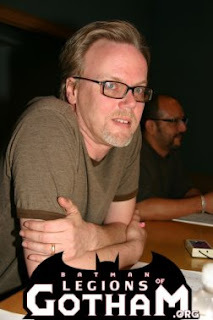 BRUCE TIMM: Yes, my first exposure to Batman as a character was Batman the TV series. But honestly, I didn’t know it was supposed to be a parody or campy. I thought it was the coolest thing I’d ever seen. Of course, I was 5 at the time. But all in one fell swoop, I became an instant super hero fan. Later on, as I got older and started reading more comics and getting into the super hero scene, I realized that the Batman show was kind of a comedy. I was reading Neal Adams comics and thinking, “Batman is kind of cooler than that show – he’s kind of scary and mysterious.” So my perception of Batman changed over time, and then I went through the periods with Frank Miller and the Tim Burton movies. So now I’ve got these warring Batmans in my head. I still love the Adam West/Batman show. I still love the Neal Adams take on Batman comics. I still love The Dark Knight. All of these things totally contradict each other, and yet it’s fine to me. I’ve said it over and over again – Batman as a character is such a strong concept, he’s the kind of character that you can take him in any number of ways and it still feels right. Batman: The Animated Series is a really good version of Batman. 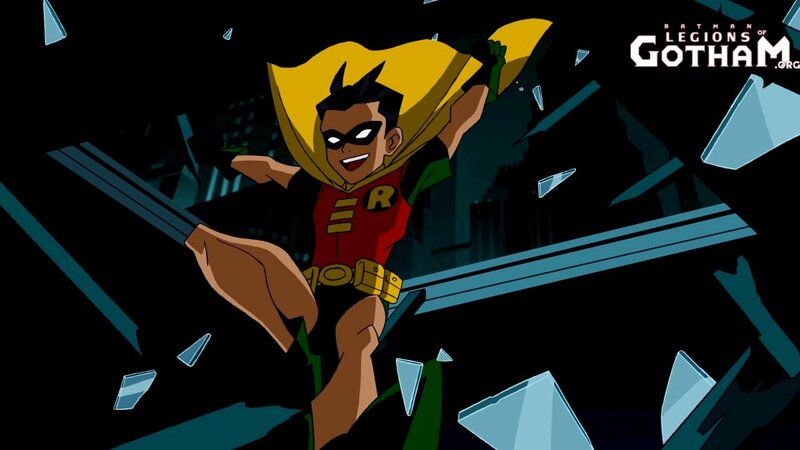 Batman: The Brave and the Bold – that’s a really good version of Batman. They have equal value.